Greek island draws millions of tourists but residents talk of pressure on infrastructure and divide between haves and have-nots. Sunset on Santorini. As dusk falls, the crush begins. With the exquisite choreography of a well-honed ritual, coachloads of tourists descend on Oia, the stunning settlement perched on the island’s northern tip. Pushing their way along the village’s packed central alleyway – past shops selling luxury garments, exclusive Greek designers and Jimmy Choo shoes – they have one goal: to glimpse the flaming fireball slip into the sea. 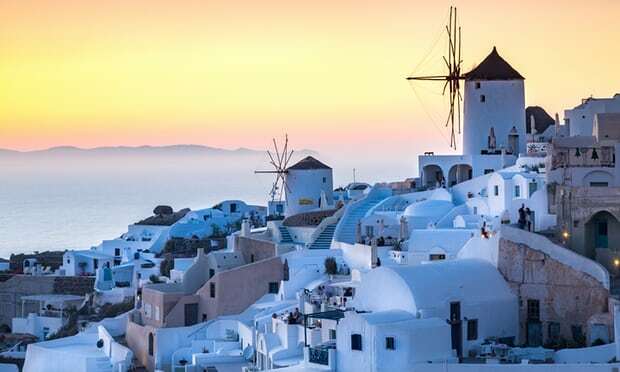 Sunset is at the essence of Santorini’s enduring myth; the reason why the Cycladic isle of orange skies and white chalk houses is repeatedly voted Europe’s most popular destination. From the vantage point of the eateries and bars that line its clifftop rim, its success is embodied in the expensive tastes of patrons willing to pay for pricey cocktails and panoramic views. A villa hewn into the precipitous rocks overlooking its volcanic caldera can cost €5,000 (£4,600) a night. And with growing demand for the spectacular backdrop for weddings, marriage proposals and vow renewals, everyone is booked solid. It is a world away from the €1 shops patronised by struggling Greeks on the other side of the southern Aegean island. This year close to 2 million holidaymakers will visit Santorini, lured by the beauty of a place transfigured by a volcano so great when it erupted in 1613BC it is believed to have inspired Plato’s telling of the legend of Atlantis. Almost no other place in Greece – with the exception of party playground Mykonos – can lay claim to such success. In a country humbled by crisis – where 23% are unemployed and are often unable to pay basic utility bills – it is an achievement that other parts of the tourist-dependent country can only dream of. For the first time 141 hotels – up from 35 in 2013 – will stay open this winter, prolonging the season and ensuring local people cash in on ever-growing profits. It is a scene far removed from the gruelling 1950s, when mass migration followed a devastating earthquake that resulted in most of the island’s merchant elite fleeing to Athens. Electricity only arrived in 1974. Memories of poverty are still visceral and real. But success has also brought suffering. 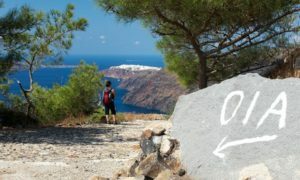 Like the staggering debt load at the root of Greece’s long-running drama with bankruptcy, the tourism boom has amplified socioeconomic tensions and placed an intolerable burden on the island’s infrastructure. Behind the scenes, local people are becoming agitated. “Our population has shot up because success has meant that everyone wants to work here,” says Nikos Zorzos, Santorini’s mayor. Zorzos, a former school tutor, is in his second term. 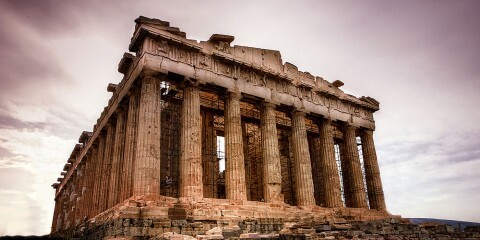 His visionary policies have won praise in Athens, where politicians see tourism as the antidote to the punishing terms attached to financial rescue from the eurozone and International Monetary Fund. But the ebullient mayor cannot mask his concerns. Santorini is being transformed before his eyes. Environmental disaster beckons. Construction is such that “at least” 11% of the island has been concreted over, he says, citing a recent report by the University of the Aegean. 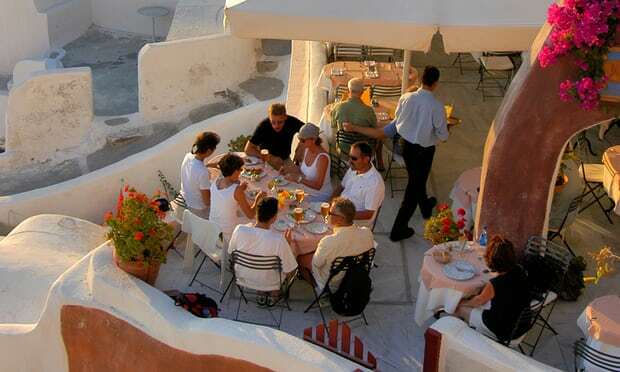 There are more than 1,000 beds per square km, more than any other isle after Kos and Rhodes, and in a destination of only 76 sq km, more than 700 restaurants, cafes, bars and bakeries – the vast majority concentrated in Fira, the main town. 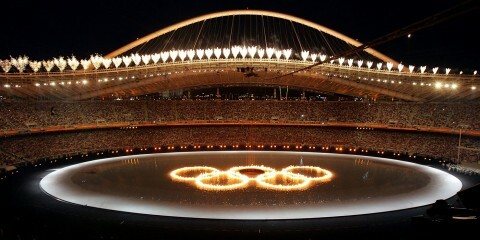 Zorzos has appealed to the authorities in Athens to put a break on the building spree. In an unprecedented step, he has also capped visitor numbers this year, limiting the number of cruise ship passengers disembarking daily to 8,000 people. Last year 636 ships docked at the island, the country’s most popular cruise destination. There were days when 18,000 passengers arrived, all wanting to see the famous island of narrow lanes and blue-domed churches. Ironically, the concern is shared increasingly by hoteliers and local businessmen. Greece is due to receive 30 million tourists this year, an all-time high that has already helped stoke the engines of a lacklustre economy. Of that number, 1.5 million will be from China, a tenfold increase from 2016. With its famed Minoan Bronze Age site at Akrotiri – buried and preserved under the volcanic ash that covered the island in the 2nd millennium BC – Santorini is the most popular Greek destination outside of Athens among Chinese tourists eager to discover the country’s cultural antiquities. For many in the industry Santorini’s success is bittersweet. Nikolas Nomikos, who presides over Santorini’s 3,500-strong Trade Association, agrees. 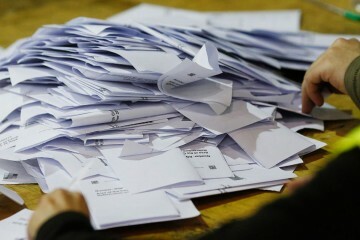 It’s a race against the clock with ports, police, garbage collectors and an overstretched public sector struggling to keep up. Yet he also believes in the power of the market. Like so many on an island where few thought it could ever be so good, the affable Nomikos is unmistakably optimistic.